YANGON—It has been nearly nine years since the last time former General Thein Sein was in military uniform. His presidency in 2011 saw him wearing civilian suits. Constitutionally, the same was true for his fellow generals and senior military officials who took Union ministerial posts in his administration until March 2016. But they were their former military selves on Tuesday—for a while—donning military outfits to attend a ceremony. A flock of former senior military officials mostly from the previous administration, including former general and ex-president U Thein Sein, gathered at a statue unveiling ceremony in Naypyitaw. 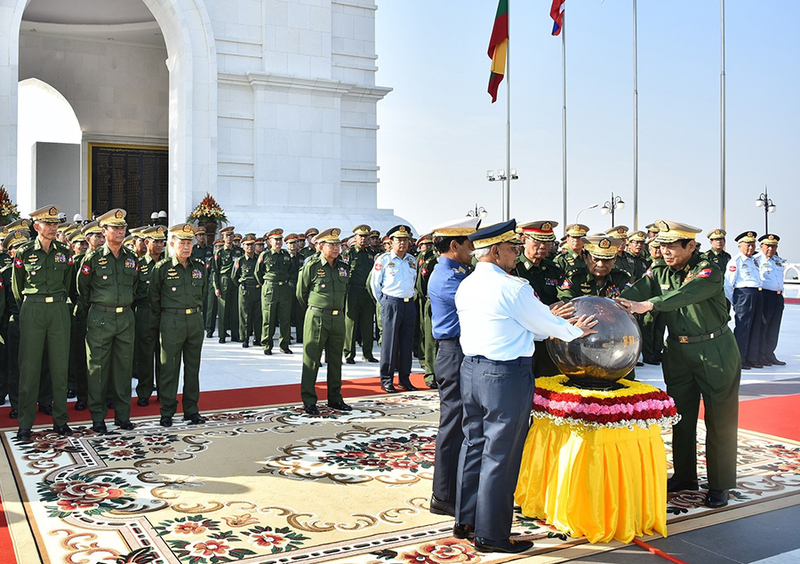 The ceremony was held to honor the six holders of the prestigious military title “Aung San Thuriya” (all are deceased) and was joined by the current military chief, Senior General Min Aung Hlaing, and other serving officials. Among the attendees were former Union minister U Ohn Myint, a former lieutenant general who used to threaten people by saying, “I can go around and slap everyone’s face… If anyone insults or opposes the government,” when he was the head of the Ministry of Livestock, Fisheries and Rural Development in 2014. The others included ex-brigadier general and former immigration minister U Khin Yi, and U Tin Aye, a former Union Election Commission chairman and ex-lieutenant general. Their appearance in their old outfits seemed unusual because, apart from attending the annual military parade on Armed Forces Day every March 27, they rarely show up in their uniforms. It’s also interesting to speculate on why nearly everyone in the previous government suddenly appeared en masse in their former uniforms at a statue unveiling ceremony. Yangon-based political analyst U Maung Maung Soe said it was not unusual for veterans to attend a military-related ceremony in full dress uniform. “But it’s strange when nearly everyone from the previous administration appears at once,” he said. He pointed out that their appearance coincides with a popular campaign across the country to amend the Constitution, initiated by the NLD. The military and the Union Solidarity and Development Party have complained that the NLD’s approach is unconstitutional. “Probably, they just wanted to make a show of force. Who knows?” he said. Dr. Min Zaw Oo, a Myanmar affairs expert, said that it is not surprising that all the former generals have gathered in the capital for the Armed Forces Day ceremony to be held Wednesday, and that maybe they happened to come in to show solidarity. But he added that it “could be that [the reason] is to show that former and existing personnel want to demonstrate that they pay attention to their heroes, regardless of their ethnicities,” as four of the six service men with the Aung San Thuriya title were ethnic Karen, Chin and Gurkha. But Brigadier-General Zaw Min Tun, a military information officer, told The Irrawaddy that Tuesday’s ceremony at the Mausoleum for the Fallen Heroes was to honor the six servicemen from 1948 to 1950s who have received the nation’s highest military honor, which is awarded for gallantry in protecting the country’s sovereignty. For veterans in uniform, he said, it’s normal. “As in other countries, they just want to show how seriously they take these heroes,” he said.